The price of gas increased another six cents on the week, according to the latest report from the U.S. Energy Information Administration. The weekly survey of districts shows the average price of a gallon of regular unleaded is now $2.33, up 19¢ in the past three weeks. The weekly price increases were led by shocking hikes across California and the broader West Coast Region, where prices jumped 14¢ and 9¢, respectively. 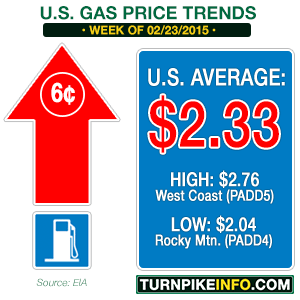 Price increases across the rest of the nation were either at or below the national average increase of 6¢ per gallon. For truckers, the price of diesel also increased, but not as intensely. The nationwide average cost for a gallon of diesel is now $2.90, up about 4¢ on the week. The price of diesel came down sooner than its regular gasoline counterpart in 2014, but it did so at a slower rate than gas. As unleaded fuels have increased in price, the diesel price increases have also been moving at a slower pace, which means somewhat less volatility, at least at the retail level. The price changes are reflective of continued uncertainty in the crude oil futures markets, which have found a broad trading range during February. A supply glut is forecast to persist through at least the second, and most likely the third quarter, according to industry analysts, which was a significant part of the precipitous declines seen since July. Both Citigroup’s Edward Morse and Vitol Group’s Ian Taylor opined two weeks ago that crude oil prices were still likely to trend lower until later this year. They disagreed on the timing of a future upward move in crude, but the consensus was that the oversupply causing the downward price pressure would continue until well into the summer. 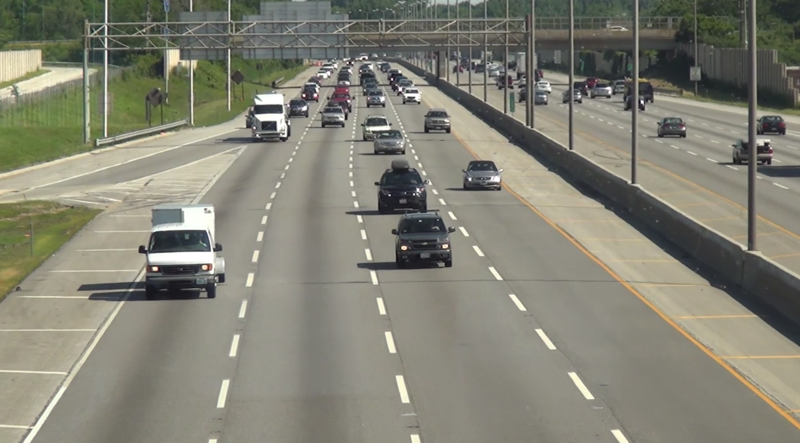 This summer view of the Tri-State Tollway, near Chicago, may seem like a distant memory now, but refinery operators are already switching to output summer gasoline blends, contributing to higher prices. The other factor is the summer fuel blends, themselves, which reflects increased refining costs for producers. That element is likely the greatest issue for consumer prices at the moment, as this is the time refineries are switching over to summer blends for the coming driving seasons. The summer fuel blend issue aside, supply is expected to remain quite plentiful, which could put an upward limit on the current price increases. Vincent Piazza of Bloomberg Business reported February 18 shale production continues to increase, even in the current environment. The reason is the efficiency of drilling sites versus their older counterparts, many of which have been closed down in the past year. For consumers, the price of gas is still far cheaper today than it was at this time last year. On average, most drivers are paying about $1.11 less for a gallon of gas than at this time in 2014. For truckers, the nationwide average price is down by about the same amount, at $1.12.